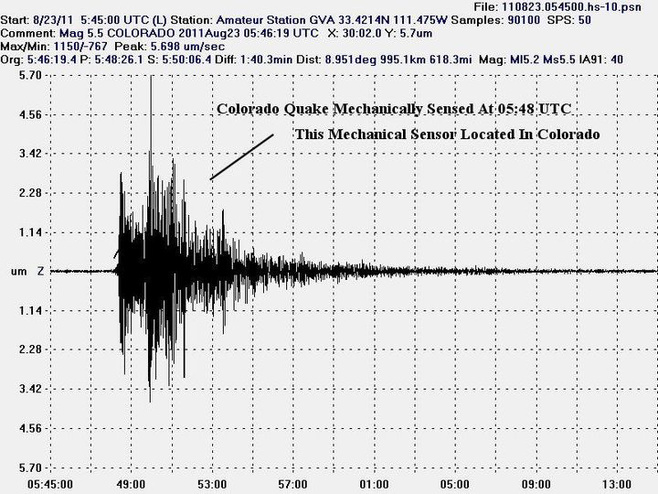 Above: 9/23/11, Colorado Quake electromagnetically detected before it mechanically manifested. 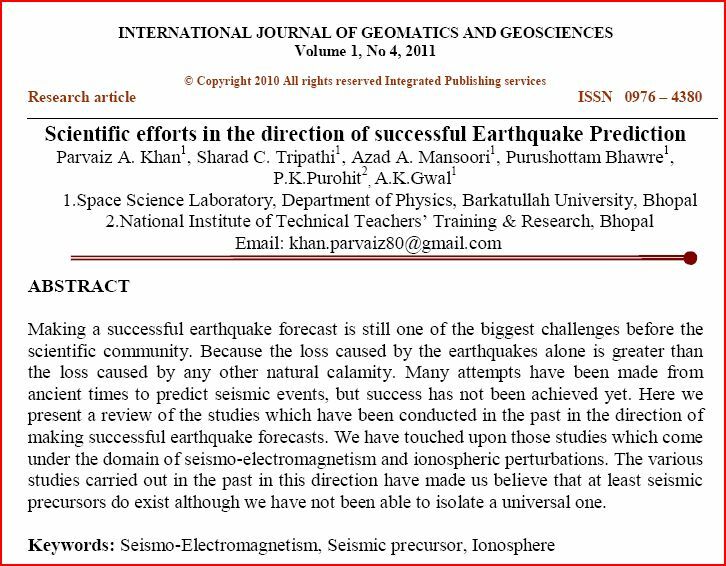 ABSTRACT: We outline a long-term monitoring method of detecting tectonic strain and electromagnetic signals indicative of potential earthquake activity. For over ten years, electrical engineer Ben Lonetree has been monitoring several parameters of geophysical and solar activity with his custom system and proprietary software. 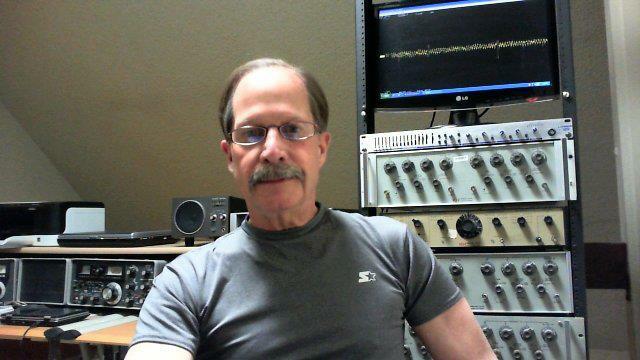 On numerous occasions he has been able to detect strain originating at various levels within Earth's crust at both local and globally remote locales. 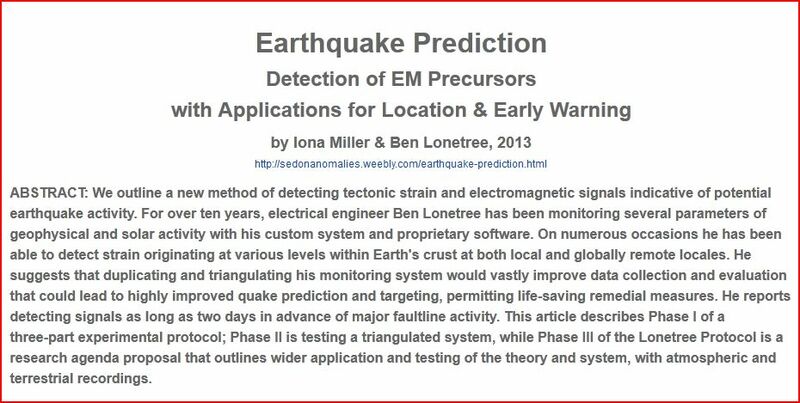 He suggests that duplicating and triangulating his monitoring system would vastly improve data collection and evaluation that could lead to highly improved quake prediction and targeting, potentially permitting life-saving remedial measures. 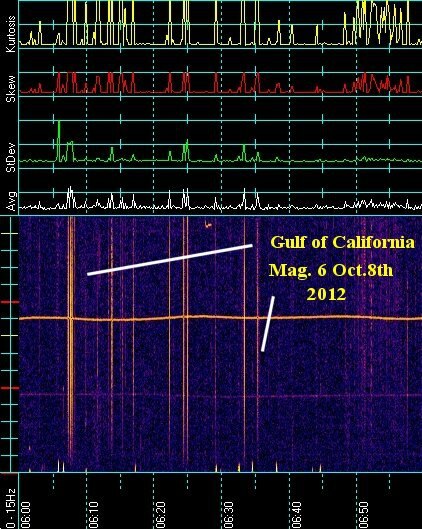 He reports detecting signals as long as two days in advance of logging major seismic activity. Most suggested precursory earthquake anomalies were recorded serendipitously by observing systems established for other purposes. Funding for directed projects has been rare or non-existent. This article describes the low-cost, privately-funded Phase I of a three-part experimental protocol; Phase II is testing a triangulated system, while Phase III of the "Lonetree Protocol" is a research agenda proposal that outlines wider application and testing of the theory and system, with atmospheric and terrestrial recordings, as well as satellite missions. Finally, we propose a network of 12 ultra-low frequency electromagnetic (ULF EM) recording sites. One cost-saving measure is to install them in existing seismic stations. Transportable recording systems could be deployed in rapid response mode in the aftershock region of a major earthquake to record post-seismic EM activity. A reference station should be located in seismically inactive area with relatively low artificial noise. Deciphering these signals and learning how to "read" them has remained a source of great frustration. Many seismologists have lost faith that earthquakes would ever become predictable beyond statistical probabilities, which leave uncertainties of years, even decades. Some seismologists have proclaimed categorically that, due to their chaotic nature, earthquakes are fundamentally unpredictable. The statistical average for Class 6+ quakes is one every two days somewhere in the world, most probably in the Ring of Fire. But they tend to group around the Lunar Full and New phases. It is a virtual certainty to have a Class 6+ quake every syzygy or within a day. It is generally true that you will get two or three within a three day syzygy window. Known and hidden fractures in the earth's crust continue to threaten the world economy. Some researchers expect increased quake activity due to increased solar activity and magma plume movement arising from the cooling dynamics of earth's core. As we learn to deal with many vectors of climate change, it becomes necessary to maximize our anticipatory skills of such potentially catastrophic outcomes. Earth is a dynamo. When the sun reaches deep into the earth, it "talks" to her and modifies the generator within her. The ionosphere is one poorly understood channel. The sun interacts magnetically with the solid Earth, reaching down into the crust, generating forces that can trigger earthquakes that either rupture or slide. 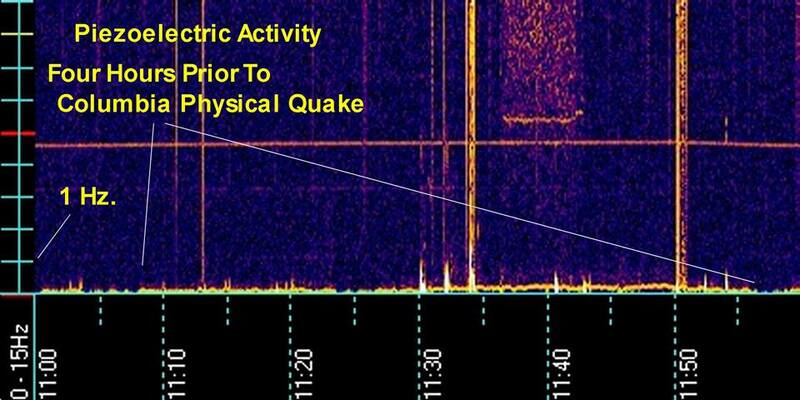 Before major earthquakes, the crust "talks" back to the ionosphere, causing perturbations. Magnetic field maxima and minima move around over the surface of the earth. The total amount of coupling changes over time. Electrochemical loops cross, increasing quake likelihood. Earth itself acts as a magnet. Minerals in the earth’s crust contain dormant electronic charge carriers. They act like electronic crystals when energized. Squeezing, heating or stressing such rocks activates them so waves can travel through the earth for kilometers changing conductivity, generating Lorenz force interacting with tectonic force vectors, pushing the system over the edge. absence of ULF EM signals. ULF spectrum contains the highest frequency signals that can reach the Earth’s surface with little attenuation. Magnetic storms can create higher than usual noise levels. Rapid magnetic field variations lead to ULF emissions. They ionize the plasma in the atmosphere, measurably perturbing the ionosphere, the coupling mechanism. Stressed rocks are active charge carriers which turns them into batteries. The driving force is deep magma and tectonic strain. Electric currents, up to millions of amperes, start to flow like in a semiconductor battery, perturbing earthquakes. Currents up to millions of amperes flow along stress gradients, fluctuating and emitting EM radiation. Therefore, Earth emits powerful broadband EM waves prior to quakes, in microhertz to about 20 hz. extremely low frequencies (ULF). The earth hosts waves much like the ocean; they are amplified during quakes. Fault mechanics describes the behavior of geologic faults, elements of rock under stress. Triggering can occur by shifting stresses, building strain prior to slippage, or by dynamic change caused by passing seismic waves. Subduction along tectonic plate boundaries is one persistent force leading to seismic activity. Interplate earthquakes result from the motion of tectonic plates. If rock is modeled as discrete elements in a critical state, a single disturbance can influence a wide area. There are still areas of North America rebounding from the weight that pressed down in the Ice Age. In places such as the New Madrid fault an incident could disrupt the interior of the US with catastrophic results. Deep sea avalanches from potential quakes and vulcanism, such as Cumbre Vieja, are another detectable vector. Injections of fresh or salt water into fault zones exacerbates their instability. Tectonic strain creates a piezoelectric effect that is observable and quantifiable prior to seismic displacement events and those not involving major seismic activity. Thus, normal alterations in tectonic (structural) stresses occur within the Earth's crust and are mediated by piezoelectric-like effects. Earthquake lightning, fracture-related luminosities or "earth lights" are one natural phenomena associated with piezoelectrics. "In a study published in “Nature,” USGS seismologist Fred Pollitz and colleagues analyzed the unprecedented increase in global seismic activity triggered by the Magnitude-8.6 East Indian Ocean quake of April 11, 2012, and in a recently published study in the “Proceedings of the National Academy of Sciences,” seismologist Volkan Sevilgen and his USGS colleagues investigated the near-cessation of seismic activity up to 250 miles away caused by the 2004 M9.2 Sumatra earthquake. While aftershocks have traditionally been defined as those smaller earthquakes that happen after and nearby the main fault rupture, scientists now recognize that this definition is wrong. Instead, aftershocks are simply earthquakes of any size and location that would not have taken place had the main shock not struck." Not all faults produce surface traces, and some fault complexes are active at varying depths at different times. Earthquake observation is also one of the most valuable diagnostic precursors to magma movement and volcanic events. Improved detection and prediction might be particularly valuable in identifying aftershocks and in areas prone to "earthquake storms". In earthquake swarms multiple event potentials need to be pin-pointed and notified quickly for emergency mitigation, evacuation, or disaster relief. We might also improve detection of remotely-triggered earthquakes, kindled by very large earthquakes. Currently, there is no reliable system in effect for the prediction and locating of earthquake potential. Life and property might be saved by such a system, comparable to tsunami warning of volcanic activity alerts. In fact, this methodology could be added to protocols already in place for such warnings, improving them considerably. Recognized in NASA documents, Lonetree has previously made significant contributions to the methodology of monitoring and detecting Schumann Resonance, geomagnetic flux, and space weather. Electrical engineer, Benjamin Lonetree brings the pragmatism of a true benchman to the challenge of geophysical signal monitoring. Such practitioners prefer to make and improve their own gear in accordance with intuition and knowledge gained from direct experience. Thus, Lonetree wraps his own coils and commissioned the creation of custom software to operate his system. Commerciality is only secondary, or incidental. As experimentalists, benchmen learn how to refine their systems and readings over time and their proofs are demonstrable and repeatable, when circumstances arise. In this case the construction of equipment and the reading of instrumentation is fully teachable. Lonetree has shared his material via social media, in peer-reviewed journals, and backchannels for a number of years. His methodology is an improvement and upgrade of standard detection, not blue sky research, although it has been largely a solo effort. Since precursors are likely non-seismological, the short-term earthquake prediction requires a new multi-disciplinary science. Abstract: In this talk, I will discuss the solid-state physics of rocks and earthquake precursors. Earthquake precursor phenomena have been known for some time. They are caused by stresses that build up in crustal rocks. As we have found in the laboratory, these stresses more precisely, differential stresses and strains activate mobile positive charge carriers (defect electrons in the oxygen anion sublattice sublattice: O in a matrix of O2). These positive holes (or pholes for short) flow from the generation region into the surrounding rock. They effectively turn a rock into a giant battery. Under specific conditions, which cause the battery circuit to close, large phole currents can flow. Such currents lead to a variety of phenomena: (i) magnetic field variations and low to ultra-low frequency EM emissions, (ii) ionospheric perturbations over the epicentral region, (iii) air ionization at the ground-air interface and corona discharges with light and radio noise, and (iv) the emission of narrow-band infrared (IR) photons around 10 µm. These excess IR photons are the cause of the so-called thermal IR (TIR) anomaly. Often appearing days before major earth¬quakes, TIR anomalies have been seen from space by NASAs MODIS on TERRA and AQUA, by NOAAs AVHRR and GEOS, by Europes METEOSAT satellites. These various pre-earthquake signals can be used to design an earthquake early warning monitoring system, combining space assets and ground networks. Biography: Friedemann T. Freund is with the NASA Ames Research Center, Earth Science Division, Moffett Field, CA 94035-1000. He is Adjunct Professor, Department of Physics, San Jose State University, San Jose, and Principal Investigator at the Carl Sagan Center, SETI Institute, Mountain View, CA. Low-cost, low-maintenance EM signal detectors for institutionally-sited and field-site detection are now possible. They might include such applications as automatic closure of gas valves prior to suspected events. We can conjecture about applications beyond Earth, for example, reporting stations on the Moon or Mars, where the same systematology could be applied to the study of natural and cyclical events. Seismic waves can also arise from impacts which can be studied at a distance. Lonetree claims there is a reason why his system responds to many things other magnetometers do not. 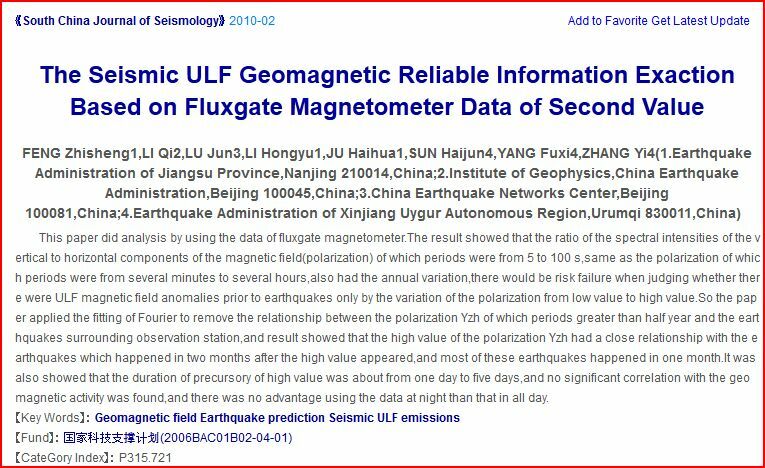 Most are fluxgate mags that sample a collapsing field at a very slow sample rate. His system is simply a very large induction coil that after the amplifier and filter stages couples into an analog to digital converter. He has the converter programmed to use a sample rate of 240 times per second. So the systems sees every little blip that occurs out there. A fluxgate magnetometer consists of a small, magnetically susceptible, core wrapped by two coils of wire. An alternating electrical current is passed through one coil, driving the core through an alternating cycle of magnetic saturation; i.e., magnetized, unmagnetized, inversely magnetized, unmagnetized, magnetized, etc. This constantly changing field induces an electrical current in the second coil, and this output current is measured by a detector. In a magnetically neutral background, the input and output currents will match. However, when the core is exposed to a background field, it will be more easily saturated in alignment with that field and less easily saturated in opposition to it. Hence the alternating magnetic field, and the induced output current, will be out of step with the input current. The extent to which this is the case will depend on the strength of the background magnetic field. Often, the current in the output coil is integrated, yielding an output analog voltage, proportional to the magnetic field. The typical fluxgate magnetometer consists of a "sense" (secondary) coil surrounding an inner "drive" (primary) coil that is wound around permeable core material. Each sensor has magnetic core elements that can be viewed as two carefully matched halves. An alternating current is applied to the drive winding, which drives the core into plus and minus saturation. The instantaneous drive current in each core half is driven in opposite polarity with respect to any external magnetic field. In the absence of any external magnetic field, the flux in one core half cancels that in the other and the total flux seen by the sense coil is zero. If an external magnetic field is now applied, it will, at a given instance in time, aid the flux in one core half and oppose flux in the other. This causes a net flux imbalance between the halves, so that they no longer cancel one another. Current pulses are now induced in the sense winding on every drive current phase reversal (or at the 2nd, and all even harmonics). This results in a signal that is dependent on both the external field magnitude and polarity. The preliminary results of years of experimental monitoring and correlation with known events indicate promising potential for the Lonetree Protocol. With a custom software program, monitoring is on-going with periodic correlations from other data sources. It is basically similar to what HAARP used with their small three foot magnetometer, but Lonetree wound a six footer with 7.5 miles of wire. 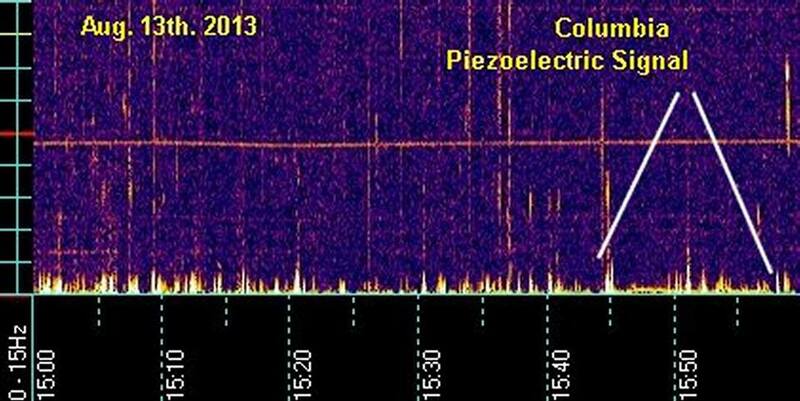 More sensitive than HAARP'S, it can detect precursors. This graph will still detect the planet's magnetic field change band more. HAARPS system, now abandoned, being near the Polar Electrojet saw more Electrojet phenomena, whereas Lonetree's system sees more of what the source produces. They are concerned about the South Atlantic anomaly. The planet's internally produced magnetic field is acting weird which is usually a precusor to major earthquake activity, presumably from an increase in rising magma plumes, carrying increased interior heat to the surface. On Lonetree's monitoring system, the blue is just the background. Like the old TV screen, you can set contrast, bright and dark. Whenever a signal happens -- be it from the sun, the earth, or beyond -- it produces a brightening in the screen. The bottom scale or y-axis as it is called is the Time. So we know what time the event happened and how long it lasted. The left side of the chart with all the small horizontal lines is the X-axis. Each little line represents 1Hz. in frequency. So the first little line is 1Hz. the next 2Hz. and on up until 15Hz. Lonetree's system detects magnetic changes in our planet's magnetic field. When a disturbance from the sun contacts our magnetic field it registers on the chart as our magnetic field is wobbling. But the Lonetree system also detects proton and electron particles also as they impact the planet. And finally this system detects earthquakes and their precursors as it sees the electromagnetic energy given off by a fault before it does a mechanical shift. A friend of Lonetree's at NASA discovered when rocks are put under great stress and pressure they emit Pholes, positively charged particles just before and when they finally break due to the stress and pressure. The positively charged Pholes leave a signature on Lonetree's equipment. Friedmann Freund describes how Pholes show the third mode of Schumann Resonance is enhanced prior to quakes. This is due to the air ionizing above the quake area. Crustal strain develops from a variety of causes including tectonic activity, tidal action and human activity. Strain is a vector in three dimensions, described in terms of dilational and distortional strain tensors (Bath, 1973; Kasahara, 1981; Richter, 1958). Freund demonstrated that when rocks are subjected to stress, the peroxy bonds break and suddenly mobile electronic charge carriers appear, so-called defect electrons that live and travel in the valence band of the constituent minerals. These charge carriers are also called positive holes or p-holes for short. His experiments showed that the stressed volume of rock becomes a source of electronic charge carriers, p-holes and electrons. "Since p-holes and electrons flow out in opposite directions, something important must happen at the boundary between the stressed and unstressed rock. The boundary allows p-holes to pass but blocks electrons. It therefore acts like a diode in a transistor. The unstressed granite is capable of conducting p-holes, meaning that it behaves like a p-type semiconductor. The electrons can flow out of the stressed rock volume only if there is an n-type connection - in our case the copper electrode", says Freund. Fluctuating currents are a source of low frequency electromagnetic (EM) radiation. Thus our model, simple as it may be, points to the possibility that the often reported pre-earthquake low frequency EM emissions arise from ground currents flowing deep in the Earth's crust. The ground currents may be very powerful, between 100,000 and 1,000,000 amperes. Since huge volumes of rocks - tens of thousands of cubic kilometers - come under increasing stress during the build-up of large earthquakes, the ground currents could indeed be enormous. Persinger also reports that emission of strain-produced radiation is a precursor signal for earthquakes. Elastic waves propagate after ruptures. "But the piezoelectric field might also create transistors within the rock, using as barriers the layers of semiconducting minerals occurring naturally in the ore. These transistors could be coupled into circuits, and an EM emission caused by the formation of microcracks could be amplified, in theory, by these piezoelectric and semiconducting minerals. It is immediately obvious - 11 - that in this mechanism the frequency of the amplified EM wave would be dependent on several variables, especially the composition of the rock. This frequency could, depending on these variables, be represented at many points in the EM spectrum, including radio, infrared, visible and x-ray wavelengths. As a point of note, it has been shown that ultra- sonic pulses can also be generated by rock fractures (Demin et al., 1981). " So the trick to the Lonetree Protocol is to learn what is the sun's signature and what is earth related. Of course there are other particles coming at us like cosmic rays to differentiate. Scientists from the University of Serres and the Democritus University of Thrace, both in Greece, reported that DEMETER recorded large variations in the electric field above the Earth, "a significant increase in energy" in the 30 days before the earthquake. 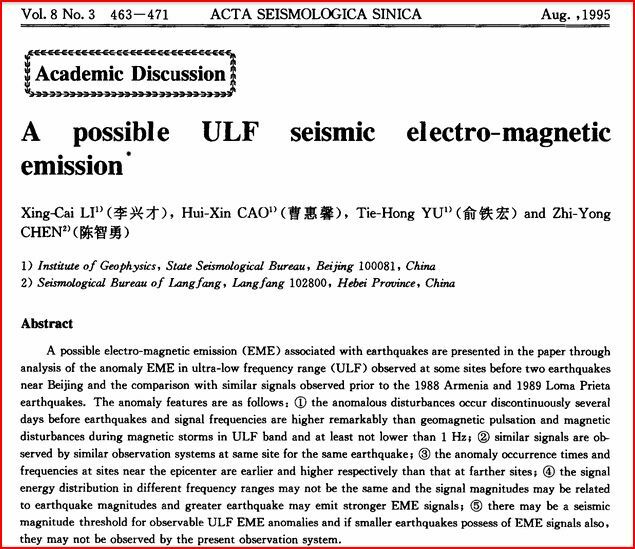 "This result clearly indicates that the change in energy of ULF (ultra-low frequency — in the range of 0-20 hz) magnetic waves could be related to strong precursory earthquake phenomena." They write that theoretical studies and laboratory experiments suggest that the deformation of rocks under pressure and temperature conditions deep in the Earth's crust change their electrical properties, which generates electrical charges that can be propagated into the atmosphere. These charges disturb the ionosphere and cause very-low-frequency emissions of electromagnetic waves. Regardless of the accuracy of this particular explanation, the results of the DEMETER satellite observations over Haiti "reveal a significant increase of the energy of ULF waves, up to 360%, for a period of one month before the main earthquake, compared with the energy of the background." These results "clearly indicate that ULF electromagnetic waves can be very useful in revealing possible precursor seismic phenomena in the ionosphere." The electromagnetic spectrum provides detectable signals for many geophysical events, including proton bombardment, magnetic field storms, and crustal displacement. ULF emissions can penetrate the crust and propagate into the atmosphere, ionosphere, and magnetosphere. The generation mechanism of pre-seismic ULF emissions can be generated mechanically by fracturing processes like piezoelectric effect and electrokinetic effect. Pre-seismic signatures, including ULF and electrokinetic effects, have been reported by Katsumi Hattori (2004), Chauhan et al (2012), and others. The induction model explains ULF emissions as caused by electrical currents induced by conductive material in the geomagnetic field. Seismo-electromagnetic emissions have been observed in the ULF-ELF range. NASA scientists Dr. Dimitar Ouzounov and Dr. Nevin Bryant confirm pre-seismic infrared (IR) emissions from the earth's surface preceding major quakes. Pre-seismic zones can emit in the ultra low frequency (ULF) radio range. Weak, but distinctive, natural signals have been triangulated within 100 km of quake epicenters by Japanese magnetometer networks (Hayakawa, et al). 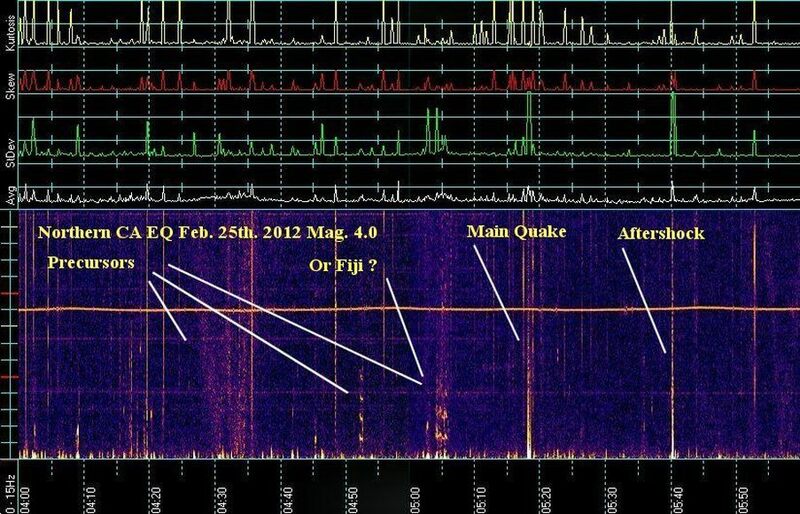 Very low frequency (VLF) radio networks in Asia (Hayakawa, et al) have found that pre-seismic changes at the earth's surface cause changes in the lower ionosphere, which in turn, cause interference with these man-made broadcasts up to a week before a big quake. In June 2004, the French space agency CNES launched DEMETER, a $22 million micro-satellite. 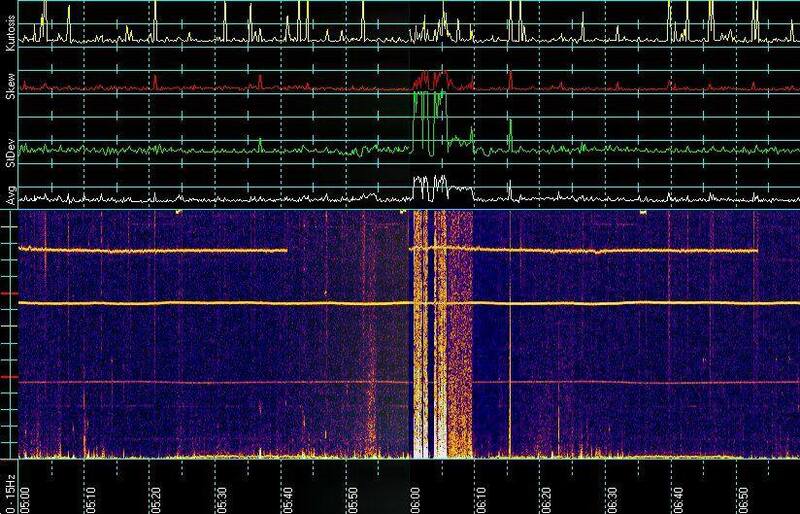 Ongoing research has successfully teased out weak pre-seismic signals from the dominating solar wind and manmade influences in the upper ionosphere (Parrot, et al). The elastic wave controls the sign (coherency) of cracks for the electrical polarity. Tzanis and Vallianatos (2002) proposed that the main source of the electrical current during fracturing is related to the motion of charged edge dislocations during crack formation and propagation in rocks under stress. The observable macroscopic ULF field can be generated by the superposition of multiple simultaneous tiny sources. ULF tends to occur for large EQs. Electrical processes in earthquakes, including electro-elasto-mechanical deformations in piezoelectric crystals, are little understood. Resonance in quartz crystals, particularly in the magnetically-polarized crystalline basement may occur. A quartz crystal provides both series and parallel resonance. The series resonance is a few kilohertz lower than the parallel. Rock flow may focus where the quartz is located because that is the weakest link. Earthquake sensitivity in animals has been attributed to their ability to sense such subtle environmental changes in electromagnetism. When pressure builds up prior to an earthquake, the quartz crystal in Earth's interior is deformed and creates an electrical charge. This phenomenon, known as the piezoelectric effect, can send electrical signals to animals, who react to a change in the electromagnetism of an area caused by rising stresses on geological faults. However, it is enough to know here that such effects are detectable by monitoring equipment. Prior to an earthquake, rocks near a fault zone are slowly compressed. The rocks change shape and store energy like a compressed spring. This is easy to understand if you think of chemical bonds as electromagnetic springs. During an earthquake, this stored strain energy is rapidly released as the fault slips and the rocks return to their unstrained state. All rocks are made up of many small crystals linked together. These crystalline rocks have an ordered and repetitious internal chemical structure), so they display the properties of crystals. (Smith) In geology, the terms basement and crystalline basement are used to define the rocks below a sedimentary platform or cover, or more generally any rock below sedimentary rocks or sedimentary basins that are metamorphic or igneous in origin. The basement is composed of hard crystalline or re-crystallized rocks such as granites, basalts, metaquartzites, or gneisses. During the development of an Earthquake, stress is developed in the region and several pre-seismic phenomena are observed, pre-seismic electromagnetic disturbances being one among them. Low frequency EM waves of pre-seismic origin are observed several hours or even days before the earthquake main shock. These waves travel from their region of origination beneath the ground through the ionosphere and to the inner- Van Allen radiation belt. These ULF waves travel (as Alfven waves) along the geomagnetic field line to reach the inner – Van Allen radiation belt boundary. When a piezoceramic element is stressed electrically by a voltage, its dimensions change. When it is stressed mechanically by a force, it generates an electric charge. If the electrodes are not short-circuited, a voltage associated with the charge appears, which is potentially detectable. Relationships between applied forces and the resultant responses depend upon: the piezoelectric properties of the ceramic; the size and shape of the piece; and the direction of the electrical and mechanical excitation. For identifying directions in a piezoceramic element, three axes are used. These axes, termed 1, 2, and 3, are analogous to X, Y, and Z of the classical three dimensional orthogonal set of axes. In the 1970s Freund articulated an essential insight that led directly to a new semiconductor theory of the earth's crust. A solid-state physicist, Freund was focused on ceramics, when he realized that the dehydration/crystallization reaction which forms all non-sedimentary rock also creates dormant "positive hole pairs." Ordinary rocks are insulators. Rocks placed under great stress, however, sometimes act like semiconductors. Freund believes that, before a quake, pairs of positive charges called 'defect electrons' or 'positive holes' split up and migrate to the surface of stressed rocks. There they recombine with each other and, in the process, release infrared radiation. This explanation has some support from experiments, but it's still a young theory that hasn't gained widespread acceptance among scientists, Freund notes. Holes have long been a commonplace term of semiconductor theory. Holes are virtual particles capable of transmitting an electronic charge. Rock is normally a strong insulator. However, when these dormant positive holes are activated in rock under stress, the holes act as positive charge carriers. They pass through rock almost as easily as an electron passes through a metal wire. The effect of these charges (phase velocity) is transmitted through the earth. Freund developed the necessary lab techniques to track the charge propagation and to perform other essential measurements needed to confirm his findings. Competing theories exist to explain earthquake precursors, but only the semiconductor theory has led to successful replication of EM and IR precursors in the lab. However, "Geology journals weren't interested because it was semiconductor physics," Freund says. "And physics journals weren't interested because it was geology." Hayakawa's group has characterized the evolution of natural ULF signals emerging from below the earth's surface. His network has detected ULF signals preceding earthquakes from shallow to mid depths, but for unknown reasons, not from deep quakes. 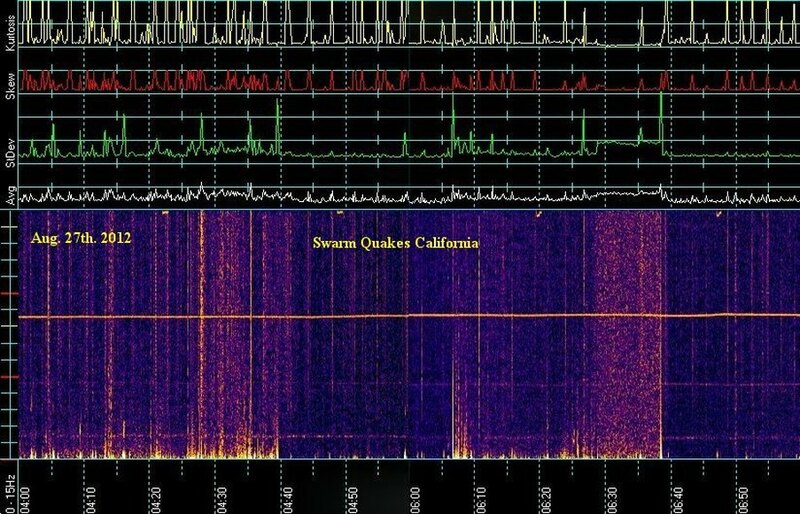 Within his network, these signals are detected only from quakes exceeding 5.5 magnitude, and reliably so, when magnitudes reach or exceed 6. Range appears to increase with quake magnitude. Although the Sumatra quake lay far outside Hayakawa's network, strong fluctuations in the VLF were noted from five days before the quake struck on Dec. 26, 2004 and continuing for seven days after. The titanic scale of the Sumatra quake (~9.3) may have contributed to the long-distance detection, Hayakawa says. Hayakawa's precursor studies dovetail with a critical aspect of Freund's semiconductor theory. 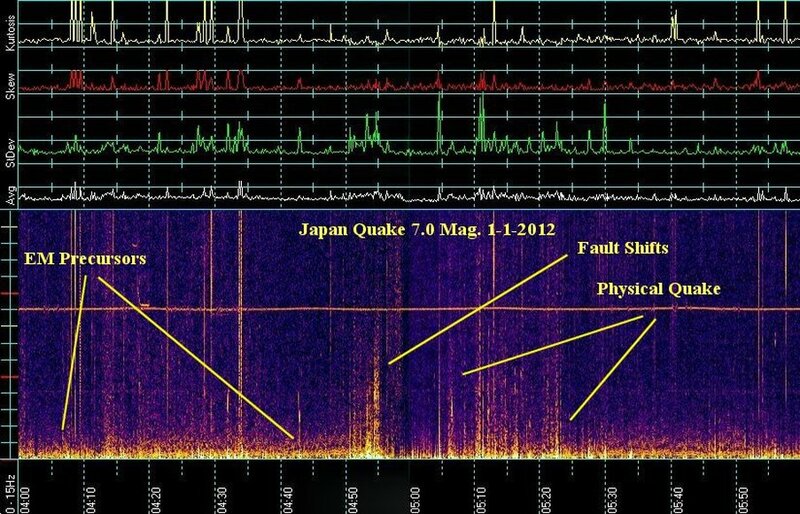 Hayakawa has detected signals up to one week before a seismic event. This would seem to be consistent with the view that non-destructive stress is sufficient to initiate EM effects. Some EM effects, like infrared emissions commence soon after non-isometric stresses reach moderate pressures. In the lab, positive holes stream freely to the surface, generating IR effects. Arrival of these positive charge carriers at the earth's surface also can affect the ionosphere in ways that interfere with manmade VLF radio. However, in Freund's semiconductor theory of the earth's crust, the positive hole currents that generate natural ULF radio emissions deep in the earth must follow a more circuitous route. 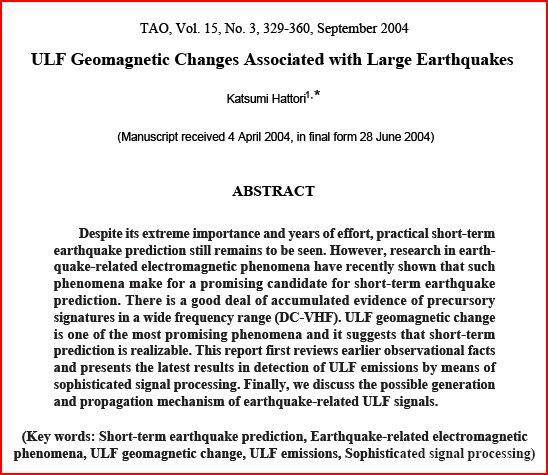 Consequently, ULF effect should be seen only before more powerful quakes. Positive holes flee a stressed rock volume wherever they are activated. They can stream freely to the earth's surface and collect at peaks and other areas of high curvature, creating IR and visible corona. But the physics of holes strands negative charges at the boundary between stressed and unstressed rock. They cannot follow. Within the earth's crust, there exists an upper zone, which permits p-type conductivity (positive holes). This zone is normally separated from a lower zone, which permits n-type conductivity (virtual electrons, or negative holes). Under normal stresses, the two zones do not interact. Years of event captures by Lonetree provide evidence of strong correlations with subtle and major earthquake displacement events, with varying lead times. We present a low-cost approach for meaningful electromagnetic monitoring and Lithosphere-Atmosphere-Ionosphere Coupling. Duplication, distribution, and triangulation of such monitoring systems could significantly improve earthquake monitoring, detecting, and prediction. Triangulation is the process of pinpointing the location of something by taking bearings to it from two remote points. Triangulation from duplicate monitoring stations could help find and map areas at risk in advance. Freund, F. (2002). Charge generation and propagation in igneous rocks. J.Geodyn. 33, 543-570. Hayakawa, M. (2000). Monitoring ULF magnetic disturbances and schemes for recognizing earthquake precursors. Phys. Chem. Earth, Part A Solid Earth Geod. 25, 263-269. Johnston, M., & Mueller, R. (1997). Review of electric and magntic fields accompanying seismic and volcanic activity. Surv. Geophys., 441-475. Molchanov, O. A. (1995). Penetration characteristics of electromagnetic emissions from an underground seismic source into the atmosphere, ionosphere and magnetosphere. J.Geophys. Res 100, 1691-1712. Molchanov, O. A., & Hayakawa, M. (1998). On the generation mechanism if ULF seismogenic electromagnetic emissions. Phys. Earth Planet, 210-210. Nitsan, U. (1977). Electromagnetic emission accompanying fracture of quartz-bearing rocks. Geophys. Res.Lett. Parrot, M. (1990). Electromagnetic Disturbances Associated With Earthquakes: An Analysis of Ground-Based and Satellite Data. Journal of Scientific Exploration. Vol 4. No. 2, 203-211. Parrot, M. (1993). 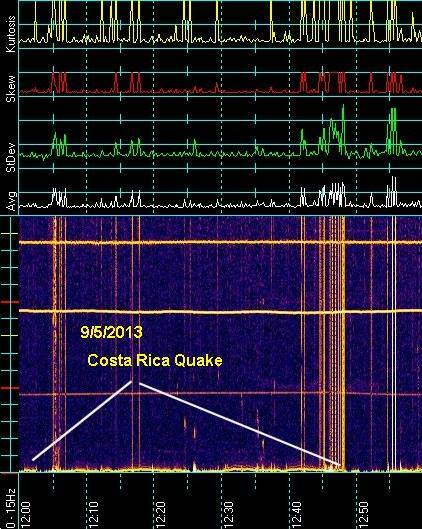 High frequency seismo-electromagnetic effects. Phy. of the Earth and Intpl Inter. 77, 65-83. Tzanis, A. and F. Vallianatos, A physical model of electrical earthquake precursors due to crack propagation and the motion of charged edge dislocations, 2002. In: M. Hayakawa and O. Molchanov (Eds. ), Seismo Electromagnetics: Lithosphere-Atmosphere -Ionosphere coupling, TERRAPUB, Tokyo, 117-130. Earthquake lights and the stress-activation of positive hole charge carriers in rocks, Physics and Chemistry of the Earth, Parts A/B/C Volume 31, Issues 4-9, 2006, Pages 305-312. France St-Laurent, John S. Derr, Friedemann T. Freund. http://dx.doi.org/10.1016/j.pce.2006.02.003 (abstract only). http://www.portaldiabetes.net/elerizoyelzorro/documentos/EQLights.pdf (full text). How did your research into mineral defects lead you to the study of pre-earthquake signals? I became interested in defects in crystals many years ago while in Germany. I chose magnesium oxide, the simplest of all oxide materials. My peers at the university were skeptical, saying there was nothing left to find out by studying MgO. However, they were dead wrong. My work led me to a defects, which everybody had overlooked for decades or misinterpreted as due to some unspecified “dirt” or contamination. One of the unusual features of these defects is that, when activated, they increase the electrical conductivity of MgO by up to 8 orders of magnitude – an enormous change. I started to characterize these amazing defects with every physical technique on the books and began to work with my son Mino, when he was a PhD student in physics at the ETH in Zürich, Switzerland. Together we developed a new analytical technique designed to learn more about those defects, which by then had been given their own name, “positive holes”. We used an underutilized fundamental physical properties of insulating materials, namely dielectric polarization at the limit of 0 Hz. In the mid-1990s, turning my attention toward studying rocks, I soon found out that minerals in common rocks have the same type of defects as my old MgO crystals. One day it occurred to me that, by mechanically stressing rocks, I might be able to generate electricity. This idea turned out to be correct but it took me another 10 years before I came up with a practical procedure that has since become a benchmark. Working with two post-docs at NASA Ames and NASA Goddard, I was able to demonstrate in 2006 that, when we apply moderate stress to one end of a block of granite about 2 feet in length, we could draw a substantial electric current from the other end. This current was due to positive holes flowing down the stress gradient. As predicted in a theoretical paper I had published in the mid-1980s, I showed in 2009, together with a group of students, that air molecules become massively ionized at the rock surface, when we stressed rocks real hard. We observed tiny sparks flying off the corners and edges of the rocks because thousands of small corona discharges were firing up. Some ten years ago I became interested in this challenging topic. My earlier work had led me to study chemical and physical processes inside crystals, inside the matrix of gem-quality minerals, which can shed light on the origin of life. During this earlier work I had run across a peculiar reaction, which nobody seemed to have noted before, and hardly anybody seemed to care about. This reaction involves small amounts of water, H2O, which become incorporated whenever a mineral crystallizes deep in the Earth's crust or mantle in an H2O-laden magma or any other high temperature H2O-laden environment. All these minerals, even those that do not nominally contain "water" as part of their crystallographic makeup, structurally dissolve some H2O in the form of hydroxyl, typically Si-OH, and a major part of it in the form of hydroxyl pairs, Si-OH HO-Si. In the mid-1970s, long before I became interested in either the origin of life or pre-earthquake phenomena, I had discovered that such hydroxyl pairs inside crystals undergo a very unusual reaction. The two oxygens and two hydrogens fight over the electrons that they share, and the hydrogens win. They each take away one electron from their oxygens and turn into a hydrogen molecule, H2. The oxygens in turn pair up to form what chemists call a peroxy bond: Si-OO-Si. For years I did not think much of this discovery, but somehow it followed me and eventually drew me into the field of geophysics and the study of the premonitory signals that the Earth sends out before major earthquakes. Faults filled with water or brines ntroduce complications. Water may short-circuit the p-hole conduction through the rocks but it does not "kill" it. Freund projects that some of the consequences of the p-hole activation in rocks that experience ever-increasing levels of stress. We normally think of rocks as being good insulators, i.e., rocks are very poor at conducting electrical currents. However, in rocks whose minerals contain peroxy bonds, a time bomb is ticking. When these rocks are subjected to stress, the peroxy bonds break and suddenly mobile electronic charge carriers appear, so-called defect electrons that live and travel in the valence band of the constituent minerals. These charge carriers are also called positive holes or p-holes for short. Looking back over the 30 years since their discovery, I am surprised to note that I always returned to these strange and elusive charge carriers. I tried to understand their nature and to predict their behavior. The breakthrough came when I realized that these p-holes could be activated by stress. 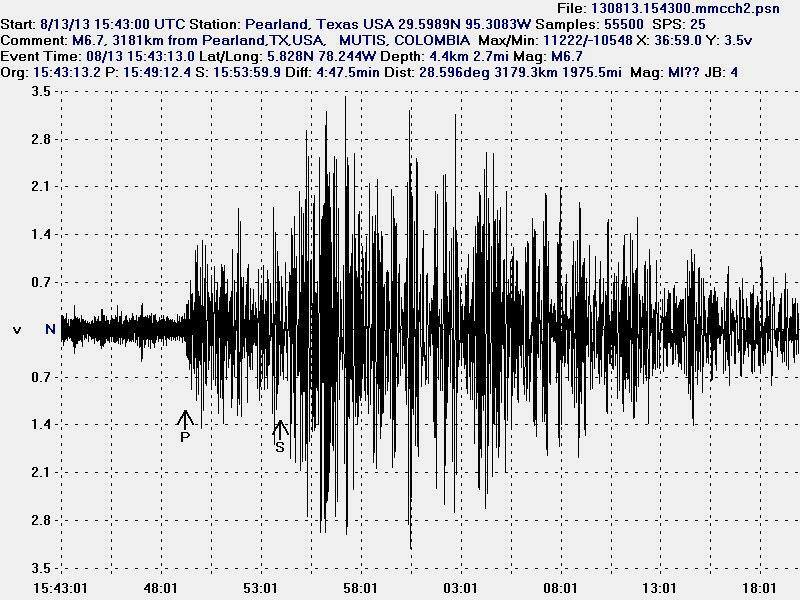 This put me squarely on the track to study earthquake-related phenomena. Still, it took several years and several wrong starts until I was able to conceive an experiment that is amazingly simple and, at the same time, full of surprises. In figure 1, a 1.2-meter long slab of granite which, together with my coworkers Dr. Akihiro Takeuchi and Dr. Bobby Lau, I had fitted with copper electrodes at both ends to measure currents and with a capacitor plate on the top surface to measure potentials. We inserted one end of the slab into a powerful press, but insulated it from the pistons. Then, we started to squeeze. We squeezed the rock many times and recorded the currents that started to flow out of both ends. The experiment showed that the stressed volume of rock becomes a source of electronic charge carriers, p-holes and electrons. Since p-holes and electrons flow out in opposite directions, something important must happen at the boundary between the stressed and unstressed rock. The boundary allows p-holes to pass but blocks electrons. It therefore acts like a diode in a transistor. Obviously the unstressed granite is capable of conducting p-holes, meaning that it behaves like a p-type semiconductor. The electrons can flow out of the stressed rock volume only if there is an n-type connection - in our case the copper electrode. Next we may wonder how long such currents can flow if we keep the load constant. We did a similar stress test with gabbro, another igneous rock. Upon keeping the load constant for 30 minutes, the two currents flow with barely any loss in their intensities. Even keeping the load constant for 12 hours leads to not more than a 15-20% reduction of the currents. This shows that, once activated, the p-holes and electrons in the stressed rock volume have a very long lifetime. How can we apply this new knowledge to earthquakes and to those hidden processes that take place deep in the Earth's crust before tectonic stresses reach a critical level where rupture occurs and the ground starts to shake? Though we stand only at the beginning of a long road to discoveries yet to come, we can already project some of our findings into geophysical reality. In figure X, you can see a sketch of a very simplified model depicting a section through the Earth's crust where tectonic forces begin to act on a large block of strong, rigid rocks, maybe 100 - 1000 km wide, 20 km thick and 50 - 10 km in the thrust direction. As stresses build up from the left, they cause plastic deformation propagating toward the right. The volume of rocks undergoing deformation becomes the source of p-holes and electrons. The p-holes can flow out horizontally. The electrons can flow out only if they can connect downward into the deeper, hotter and, hence, n-type conducting portions of the lower crust. In this model we obviously neglect to take into account the role of water which fills faults that deeply dissect the Earth's crust in all tectonically active regions. Faults filled with water or brines will introduce complications, but we already know from laboratory experiments that water may short-circuit the p-hole conduction through the rocks but it does not "kill" it. Therefore we can cautiously go ahead and project some of the consequences of the p-hole activation in rocks that experience ever-increasing levels of stress. One of these consequences is that the p-hole current flowing horizontally through the crust should couple to the electron current flowing downward. The coupling is provided by their respective electric fields. As a result both currents can be expected to fluctuate just like the p-hole and electron currents did in our laboratory experiments. Fluctuating currents are a source of low frequency electromagnetic (EM) radiation. Thus our model, simple as it may be, points to the possibility that the often reported pre-earthquake low frequency EM emissions arise from ground currents flowing deep in the Earth's crust. The ground currents may be very powerful. For instance, taking the currents flowing out of the squeezed end of the granite slab in our experiment, we may ask what would be the current flowing out of a cubic kilometer of granite or gabbro in the crust, all other conditions being the same. The answer is a surprisingly large value, somewhere between 100,000 and 1,000,000 amperes. Since huge volumes of rocks - tens of thousands of cubic kilometers - come under increasing stress during the build-up of large earthquakes, the ground currents could indeed be enormous. Looking at it from a different perspective, we can say that, even if most of the currents generated in the ground are short-circuited or annihilated by other factors, those that remain might still reach impressively large values. Another result of stress-activated currents flowing in the ground would be that some p-holes will reach the surface of the Earth. They would change the ground potential over large areas, making it more positive relative to the surrounding areas. This would have many consequences, of which I only want to mention one. Roughly 90 - 120 km above the Earth's surface the ionosphere begins, which is composed of a highly dynamic plasma of electrons and ions generated under the daily assault of extreme ultraviolet radiation from the Sun, solar wind bombardment, and cosmic rays. If the land surface below becomes increasingly positive, this plasma sheet will react. Maybe the source for the well-documented pre-earthquake ionospheric perturbations lies in the activation of p-holes deep in the Earth's crust and the mischief that they play at the Earth's surface. In hindsight it is quite amazing to see how a line of basic research that, at its outset three decades ago seemed to have no connection whatsoever to the origin of life and to earthquakes, has become a treasure trove of insights and discoveries. It is certainly too early to say that earthquake prediction is just around the corner. However, I feel confident that the discovery of p-holes in rocks and their activation by stress represents a crucial step toward cracking the code of the Earth's multifaceted pre-earthquake signals. Earth is this wonderful blue sphere, floating serenely through the blackness of space, seemingly so quiet except for white clouds drifting over its surface. For us, who live on this pale blue dot in space, the environment is often very dynamic. Earthquakes are the deadliest of all natural disasters. They are feared because they appear to strike suddenly, unannounced. The Holy Grail of earthquake science is to identify signals, which would precede the approach of large seismic events. 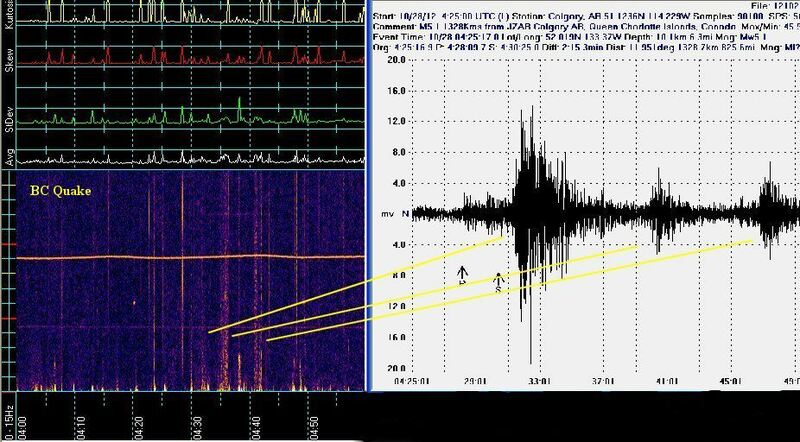 Many different types of precursory signals have been reported ranging from earthquake lights to unusual animal behavior to ionospheric perturbations. However, none of these pre-earthquake signals has been accepted by the mainstream geophysics community. All have been called anecdotal or products of wishful thinking. Prominent seismologists1 have declared with great authority: “Earthquakes cannot be predicted”, and (almost) everybody believes it. But let’s have a look at the energies involved. An earthquake of Richter magnitude 8 unleashes an energy equivalent to 1 Gigaton TNT, equal to the energy of about 66,000 Hiroshima-class atomic bombs. In the case of magnitude 9 earthquakes, the energy equivalence is to more than 2,000,000 Hiroshima-class atomic bombs. From a physics perspective it is inconceivable that the Earth would not produce some form of signals, when many thousand cubic kilometers of rocks are being stressed to the breaking point deep below. A small discovery, has provided crucial insight. It all started with a study some 35 years ago where my coworkers and I showed2,3 that the oxygen anions in oxide crystals and silicate minerals are not fixed in their valence state 2–. Instead some O2– convert to the higher oxidation state 1–. This change in the valence of oxygens involves traces of water, H2O, incorporated in the form of hydroxyls, OH–, as “impurity” in the crystal structures. As the hydroxyl oxygen anions change their valence from 2– to 1– the hydroxyl protons, H+, change their valence from 1+ to 0, leading to the formation of H2 molecules in the crystal matrix4. Chemists call such a process a redox reaction. Over the following 10-15 years we presented evidence5,6 that traces of “water” in silicate minerals are subject to the same redox conversion. All this surely sounds a bit academic, but the practical consequences are enormous. Just take earthquakes and the signals that the Earth gives off before a catastrophic rupture. An O– in a matrix of O2– represents a defect electron, a mobile electronic charge carrier like the “holes” of semiconductor fame in any transistor. In minerals we call these defect electrons “positive holes”. A breakthrough came with the recognition that any volume of rock, when stressed, turns into a battery from where electric currents can flow out. The outflowing charge carriers are positive holes. They can travel fast and far, with phase velocities up to about 200 m/sec and over distances on the order of meters in the laboratory and surely kilometers to tens of kilometers in the field. As the positive holes flow, they constitute an electric current. Like any electric current they generate a magnetic field. If and when a current fluctuates, it will radiate electromagnetic (EM) waves. 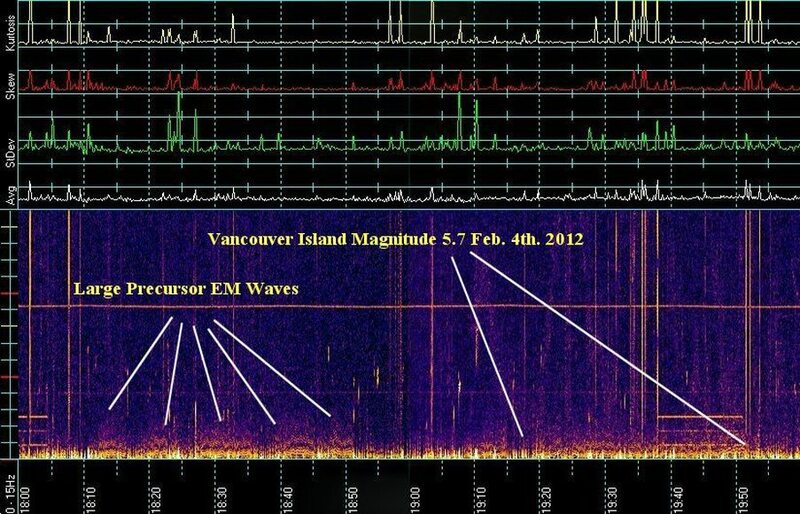 If these EM waves fall into the ultralow frequency (ULF) range, they are only weakly attenuated in the Earth’s crust. Hence they travel to the Earth’s surface from tens of kilometers below. 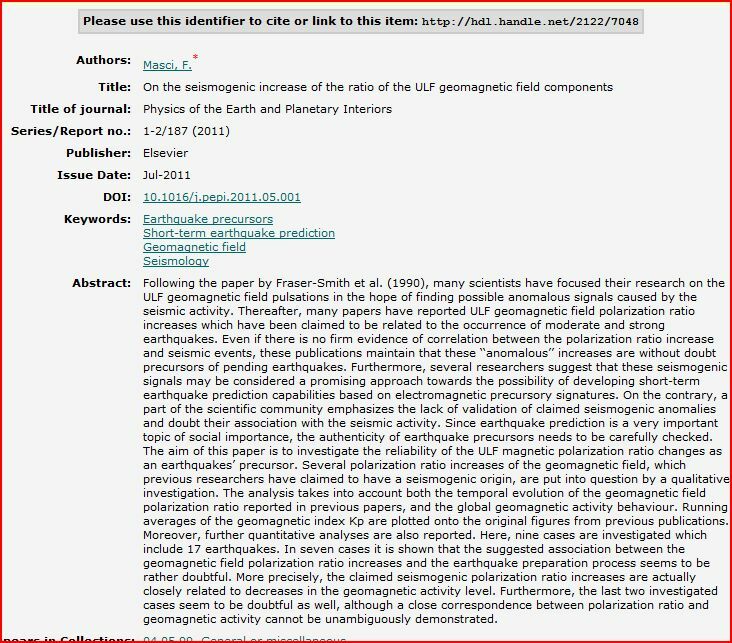 All of a sudden we saw an opportunity how to explain the fleeting ULF signals, sometimes powerful, sometimes weak, which have been recorded prior to many major earthquakes. Obviously such ULF signals look like coming from battery currents, which flow transiently in the Earth’s crust when rocks deep below undergo intense stressing. The discovery of positive hole currents provided us with insight why the pre-earthquake ULF signals are reportedly so fickle and “unreliable” as a tool for predicting seismic events. The reason is surprisingly simple: Battery currents can flow in a sustained manner only when the electric circuit is closed. In other words, the outflow of positive holes from a stressed rock volume must be balanced by an equally large outflow of electrons or an inflow of positive charges. These conditions, however, cannot be easily achieved in the Earth’s crust. The positive holes are capable of doing much more “mischief”, once they are activated by stress. For instance, as they flow through the Earth’s crust and enter water, they oxidize water to hydrogen peroxide. This is onto itself an interesting observation that leads to many ideas yet to be explored. When positive holes arrive at the surface of the Earth, they can also recombine, giving rise to a special form of infrared radiation, called the “thermal infrared” (TIR) anomaly. TIR anomalies have been seen for over 20 years in night-time images of satellites equipped with infrared sensors. Their true nature is only now emerging as we begin to understand how positive holes behave at the Earth surface. In addition, when positive holes arrive at the surface of the Earth, they build up very steep electric fields – often so steep that air molecules become ionized on a massive scale above the epicenter of a future earthquake. At first, only positive airborne ions form. As they enter the atmosphere they will expand upward and rise to stratosphere, carrying along the positive electrical potential that exists at the surface of the Earth. This effect is expected to lead to a response in the ionosphere, the plasma region which begins at about 100 km altitude and extends far into space. 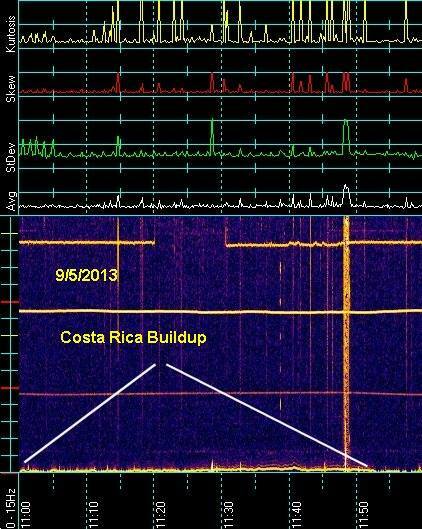 Ionospheric perturbations a few days before major earthquakes have been widely documented. They are marked by an increase in the number density of electrons at the lower edge of the ionosphere – something that seems to be in-line with the upwelling of air laden with positive ions that are injected at the ground-to-air interface above areas of high stress deep in the Earth’s crust. When positive holes arrive at the surface of the Earth in even larger numbers, laboratory experiments have shown that the electric fields at the ground-to-air interface can become so steep that they fire up corona discharges. These corona discharges lead to increased radiofrequency noise – an effect that has been widely reported prior to earthquakes. In summary, even without addressing the issue of unusual animal behavior, the discovery of stress-activated positive hole charge carriers in rocks has already helped us decipher some open questions regarding the alleged unpredictability of the most frightening of all natural disasters. 2.1 CRUSTAL STRAIN Through various processes, strain can be built up in the Earth's crust. These include tectonic activity, tidal action and human activity. Strain is described in terms of dilational and distortional strain tensors, as it is a vector in three dimensions (Bath, 1973; Kasahara, 1981; Richter, 1958). However, reasonable estimates of the size of the total strained region can be made by comparing the distances be- tween earthquake epicentres and precursory effects, indirectly using the magnitudes and energies involved (Brown and Reilinger, 1983). It is extremely difficult to judge the actual extent of precursory effects, since they will intuitively vary in type, depth and strength for each earthquake. The determination of the size of the strained region will be discussed further, at a later point in this paper. 2.2 STRAIN-PRODUCED RADIATION There are many types of reported Earthquake precursors on record, including ground deformation, change in the levels and chemistry of well-water and the unusual behavior of animals (Buskirk et al., 1981; Rikitake, 1976; Wyss, 1983). A form of precursor that has received relatively little attention is that of the emission of electromagnetic radiation. Although many such reports are spurious or represent other natural or man-made causes, a significant number are well- documented, and the existence of earthquake-related EM effects must be seriously assessed. On 31 March, 1980, anomalous EM emissions were recorded thirty minutes before a deep-focus (depth = 480 km) magnitude 7 earthquake 250 km from an observatory near Tokyo (Gokhberg et al., 1982). These emissions were widely-separated at 10 Hz and 81 kHz. Other similar emissions were re- corded for a magnitude 7.4 earthquake in Iran, 1200 km from the epicentre, at 27 kHz and 1.63 MHz. Other examples of such emissions have also been reported (Gokhberg et al., 1980; Sadovskiy et al., 1979). It has been known for some time that the strain loading of rocks and minerals produces electromagnetic emission. The strength of the emission varies with the different types of substances; the strongest emission arises from quartz and other minerals with a high crystal lattice energy, while rocks such as sandstone have a very low ability to produce emission under strain. It has been reported that there is a shift to high frequency with an increase in grain size. The actual mechanism for the production of the emission is not definitely known, although several theories have been pro- posed (Lockner et al., 1983; Mizutani et al., 1976). It has been shown that a rapid drop in the piezoelectric field when stress is released (i.e. when fracturing occurs) can produce EM emission. Experiments have shown that the peak frequency for such a piezoelectric pulse is at about 1.7 kHz, and that the energy release from the fracture of a small rock specimen with a volume of 50^3 cm is about 10^-18 J. However, there is some doubt that piezoelectricity can produce earthquake lights because of its rapid decay and the possibility of its self-cancelling nature (Finkelstein et al., 1973; King, 1983). An alternate theory for EM emission during fracturing is that of RF (radio frequency) emission caused by a charge buildup across microcracks. During strain processes, there will be discharges between walls of the microcracks which can give not only RF emission, but also IR (infrared) and visible light as well. The energy released by these small cracks has an average spectral range of between 1 and 10^3 MHz (Perel'man and Khatiashvili, 1981). The most plausible proposed mechanism involves the propagation of an elastic wave within rock, following fracture. Demin et al., (1981) have speculated that the wave would induce the growth of microcracks, and, in the case of semiconducting and piezoelectric minerals, the cracking would produce electrical discharges. But the piezoelectric field might also create transistors within the rock, using as barriers the layers of semiconducting minerals occurring naturally in the ore. These transistors could be coupled into circuits, and an EM emission caused by the formation of mi- crocracks could be amplified, in theory, by these piezoelectric and semiconducting minerals. It is immediately obvious - 11 - that in this mechanism the frequency of the amplified EM wave would be dependent on several variables, especially the composition of the rock. This frequency could, depending on these variables, be represented at many points in the EM spectrum, including radio, infrared, visible and x-ray wavelengths. As a point of note, it has been shown that ultra- sonic pulses can also be generated by rock fractures (Demin et al., 1981). Earthquake versus Electric Field - A Resistant Design with Piezo ...www.ijser.org/researchpaper%5CEarthquake-versus-Electric-FieldA-Resi...‎foundation and earthquake vibrations. 2. WORKING OF PIEZO MATERIALS. 2.1 Direct Piezoelectric Effect. Deformation of the piezo material causes an. 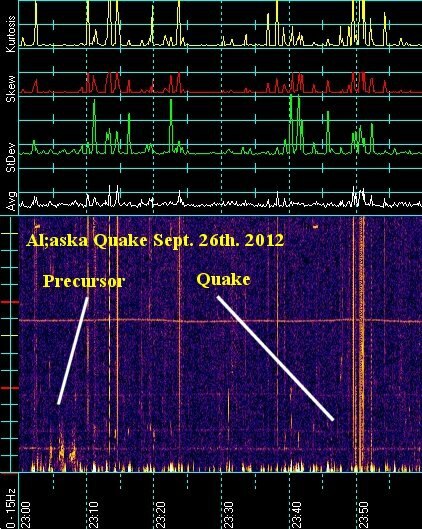 pre-seismic transients if such exist. knowledge of the physics of earthquakes. Abstract We present the results of ULF magnetic field observation at Karimshino station (Kamchatka, Russia). Using a case study we discovered an effect of suppression of ULF intensity about 2-6 days before rather strong and isolated seismic shocks (magnitude M = 4.6-6.6). It is revealed for nighttime and the horizontal component of ULF field (G) in the frequency range 0.01-0.1 Hz. Then we prove the reliability of the effect by computed correlation between G (or 1/G) and especially calculated seismic indexes Ks for the rather long period of observation from June 2000 to November 2001. Our recent data confirm the validity of the effect. We show here a similar result during a period of frequent strong seismic activity in April-May 2002. It is highly probable that the effect observed is connected with the increase in plasma density perturbations inside the ionosphere, which are induced by preseismic water and gas release at the ground surface and following energy transportation into the ionosphere by atmospheric gravity waves. Two models are discussed and computed: the first is a decrease of penetration coefficient of Alfven waves from the magnetosphere due to a turbulent increase in effective Pedersen conductivity in the ionosphere, and the second is a change in wave number (k) distribution of source ionospheric turbulence. One of the mechanisms or both could be responsible for the observed 2-3 times suppression of ULF magnetic field noise at the ground. Overview of both space-bound and earth-bound observational techniques that can be used to detect early warning signals from places where stresses build up deep in the Earth’s crust that may lead to a catastrophic earthquake. The techniques labeled in white were used for the analysis of the Alum Rock M.54 earthquake data. Credit: Bleier,Freund Earthquakes are feared because they seem to strike without prior warning. Seismologists are good at estimating the probability of large earthquakes within timescales of years or decades: ?There is a 62.4% probability that one or more earthquakes of magnitude 6.7 or larger will hit the San Francisco Bay Area before 2032?, says a US Geological Survey website. Clearly, we should be able to do better.? In fact, we probably can. To develop an effective earthquake early warning system we have to first understand what happens in the hypocenter deep in the Earth, where tectonic forces stress rocks to the breaking point. My scientific work on positive hole charge carriers, which is done at the SETI Institute and the NASA Ames Research Center, seems to provide a good start. Laboratory experiments tell us that, when a rock is stressed, it turns into a battery. Something similar must happen in all hypocenters prior to catastrophic failure. A battery is a device that can deliver electric currents. However, for a current to flow, the battery circuit must be closed. In other words, if a stream of positive holes is to flow out of a stressed rock volume, the electrons must follow suit. That's where the difficulty lies. Rocks are hole conductors but cannot conduct electrons. The electrons, co-activated in the stressed rock volume, have to take a different path. The situation is like in an electrochemical battery, where cations flow through the electrolyte but electrons have to hitch a ride through the wire connecting the anode to the cathode. It appears that, occasionally, the Earth manages to generate powerful electric currents flowing out of the hypocenter, indicating that the battery circuit had closed. The currents flow in pulses. They produce potentially powerful electromagnetic signals at extremely low and ultralow frequencies (ELF/ULF). However, there is a catch: ELF/ULF waves coming from below will be totally reflected when they hit the Earth?s surface beyond a certain angle. We don't know yet how large this angle is, but suspect that it is pretty steep. This means that only ELF/ULF waves within a relatively narrow cone will have a chance to make it through the Earth surface. To record those ELF/ULF signals directly one has to be close to the epicenter. This is rare. At the same time any ELF/ULF waves, which make it through the Earth?s surface, will be beamed straight up into the ionosphere. Once there, they will spread within the ionospheric waveguide and travel around the globe. Usually, it is hard to tell from where they came. The moderate Alum Rock earthquake, magnitude 5.4, rattled the southern San Francisco Bay in late 2007. For those who experienced it at close quarters, it was a brief, hard jolt. Overall this event was unremarkable ? except that one of QuakeFinder?s CalMagNet stations, which are spread over California along the San Andreas Fault, was barely 2 km from the epicenter.? 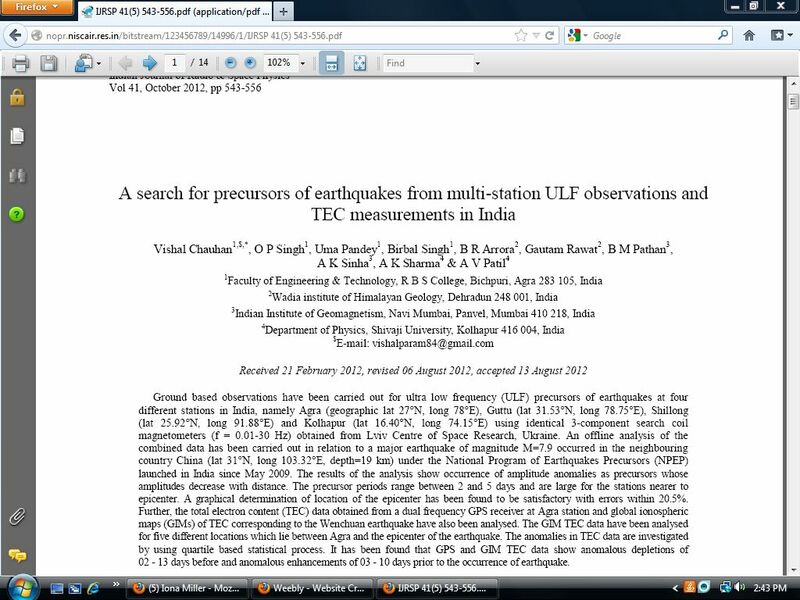 A new paper, just published by ?Natural Hazards and Earth System Science,? 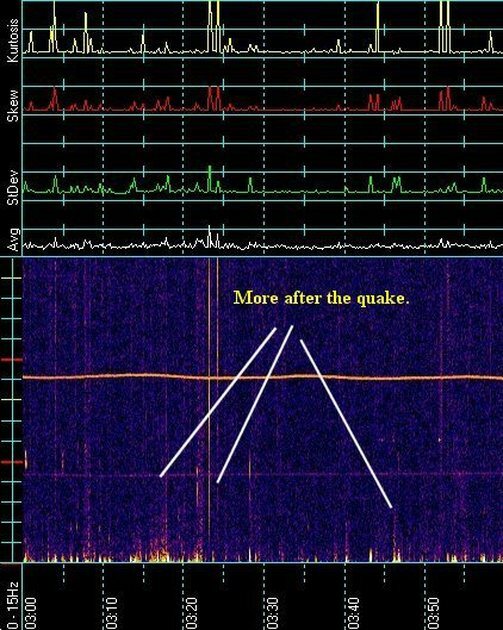 describes that three suspected pre-earthquake indicators were recorded by this QuakeFinder station: (i) short bursts of electromagnetic radiation, 10-30 sec long, increasing in number over the last two weeks before the quake, (ii) a 14-hours long episode of intense air ionization on the day before the earthquake, and (iii) a continuous wave of ULF magnetic pulsations, lasting for nearly 1 hour during the time of the most intense air ionization.? In addition, satellites picked up enhanced infrared radiation emitted from several areas around the earthquake site.? Together these observations make a strong case that they are all related to this earthquake BEFORE it struck. With observations like these the future for earthquake early warning looks bright. Once the basic physical processes are understood, we can bring to bear many different techniques, both space-bound and on the ground, each capable of providing a different piece of the puzzle. ?